The final years of the 18th century brought an increasing interest in classical buildings to both the United States and Europe. This was first based on Roman models (Federal style), but archaeological investigation in the early 19th century emphasized Greece as the Mother of Rome which, in turn, shifted interest to Grecian models. 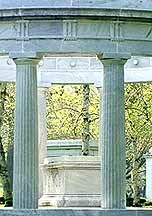 To the popular mind the Greek temple was associated with the origins of American democracy in ancient Greece. Greece's involvement in a war for independence (1821-30) aroused much sympathy in the newly independent United States. Further, the War of 1812 fought against England diminished American affection for British influence, including the still dominant Adam ("Federal" in U.S.) style in domestic architecture. The popularity of Greek Revival led it to be called the National Style. Newly established towns throughout the country even took names such as Athens, Sparta, and Ithaca. Small frieze-band windows, set into the wide trim beneath the cornice (attic), are frequent. These are often covered with an iron or wooden grate fashioned into a decorative Greek pattern. A slab on the top of a capital of a column. Perennial hares or small shrubs native to the Mediterranean and having pinnately lobed basal leaves with spiny margins and showy spikes of white or purplish flowers. Leaf used in Corinthian column capitals. An ornament of honeysuckle or palm leaves in a radiating cluster. Also called honeysuckle ornament. The lowest of the 3 main parts of an entablature: the undecorated lintel resting on the columns. A convex molding having the form of disks alternating with spherical or elongated beads. The head or crowning feature of a column or pilaster. Sculpted female figure used in place of a column to support an entablature. A supporting pillar usually consisting of a base, a cylindrical shaft, and a capital. The most ornate of the five classical orders, characterized by a slender fluted column having an ornate, bell-shaped capital decorated with acanthus leaves. For an interesting historical account of the origin of the Corinthian order, see Vitruvius Pollio, "The Ten Books on Architecture"
A decorative molded projection at the top of a wall, window or construction. The upper part of an entablature. Raking Cornice: The sloping sides of a pediment. A small rectangular block used in a series forming a molding under a cornice. The oldest and simplest of the three orders of classical Greek architecture, characterized by heavy, fluted columns with plain saucer-shaped capitals and no base. Developed on the mainland among the Dorian people and was the most common style in Greece from the 7C onwards. The columns, which had twenty flutes (see below) rested directly on the stylobate without bases; the capitals were plain. the entablature consisted of three parts, one above the other: the architrave, the frieze and the cornice. For an interesting historical account of the origin of the Doric order, see Vitruvius Pollio, "The Ten Books on Architecture"
Small drop-like projections carved below a triglyph or below a Doric entablature. A convex molding just below the abacus of a Doric capital. A molding consisting of egg-shaped figures alternating with arrow heads. A column attached to, or partly sunk into, a wall of pier. Also called an "applied column" or "attached column." The upper part of an order, consisting of architrave, frieze, and cornice. The very slight convex curve used on Greek and later columns to correct the optical illusion of concavity which would result if the sides were straight. Also used on spires and other structures for the same reason. Illustration from St. Francis RC Church. A decorative motif consisting of a series of uniform, usually vertical, flutes (grooves). A decorative design contained within a band or border, consisting of repeated, often geometric figures. Also called "key pattern." The plain or decorated horizontal part of an entablature between the cornice and the architrave. An ornament of honeysuckle or palm leaves in a radiating cluster. Also called anthemion. An order of classical Greek architecture characterized by two opposed volutes in the capital. This style developed among the Ionians who had settled in Asia Minor in the 5C BC and was considered a feminine style. Its delicate grace and rich ornament contrasted with the austere strength of the Doric order. Its main characteristics are tall slim columns with 24 flutes resting on molded bases and crowned by capitals in the form of a double scroll; an entablature consisting of an architrave, a continuous sculpted frieze and a cornice decorated with egg and dart and leaf and dart molding; a pediment with "acroteria" shaped like palm leaves at the angles. The best example is the temple of Athena Nike in the Acropolis. For an interesting historical account of the origin of the Ionic order, see Vitruvius Pollio, "The Ten Books on Architecture"
Illustration from a door in the Albright-Knox Art Gallery. The horizontal beam that forms the upper member of a window or door frame and supports the structure above it. Any of the spaces between two triglyphs on a Doric frieze. An ornamental bracket, usually in the form of a scroll with acanthus, used in series beneath a Corinthian, Composite, or Roman Ionic cornice. In classical architecture, a column with base (usually), shaft, capital, and entablature, decorated and proportioned according to one of the accepted modes - Doric (Greek Doric and Roman Doric), Tuscan, Ionic, Corinthian, or Composite. In classical architecture a low-pitched triangular gable above a facade, or a smaller version over porticos above the doorway or above a window. A triangular gable end of the roof above the horizontal cornice, often with sculpture. Broken pediment: A pediment open or broken either at the apex. Open-bed or broken-bed pediment: pediment with a gap in the base molding. Pediment: Open-topped or Broken-apex: A pediment where the sloping sides are returned before reaching the apex. Illustration from 470 Linwood Ave.
Pediment: Swan's neck: A broken pediment having an outline formed by a pair of S-curves tangent to the horizontal cornice at the ends of the pediment and rising to a pair of scrolls on either side of the center, where a finial often rises between the scrolls. Illustration from 447 Linwood Ave.
A series of columns surrounding a building or enclosing a court. A shallow rectangular column projecting only slightly from a wall and, in classical architecture, conforming with one of the orders. A rose-shaped patera . In the illustration, there is a rosette in the middle of the quatrefoil. Ornament in a Doric frieze, consisting of raised blocks of three vertical bands separated by V-shaped grooves, alternating with plain or sculptured panels called metopes. The ornamental recessed space or panel enclosed by the molding of a pediment. Also the space between an arch and the lintel of a door or window. A spiral scroll on an Ionic capital; smaller versions appear on Ionic, Composite and Corinthian capitals.